Have you seen The Hobbit? 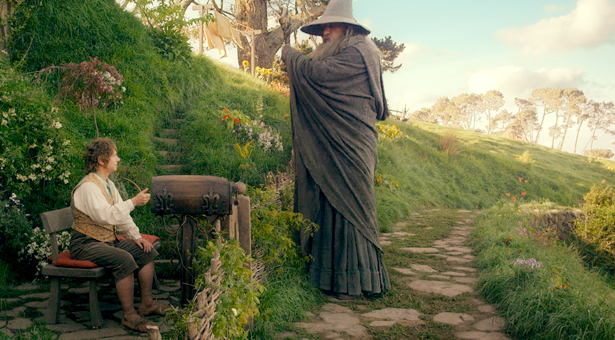 Bilbo Baggins meets Gandalf in The Shire. Photo courtesy of Warner Brothers Pictures. Since its publication in 1937, The Hobbit has introduced readers young and old to J.R.R. Tolkien’s enthralling fantasy world called Middle-earth. Perhaps you’ve noticed. Perhaps you, too, read it and discovered those fastidious, down-to-earth people called “hobbits,” and the wide world around them that they tend to ignore — Middle-earth. Compared to the three-volume epic Tolkien would write later, The Hobbit is a simple story about Bilbo Baggins, a homebody hobbit who becomes a reluctant “burglar,” assisting a company of dwarves in a dangerous quest to get their treasure back from a powerful dragon. It’s been made into a movie before: Animators who eventually formed the famous Studio Ghibli (Spirited Away, Howl’s Moving Castle) did a creative but primitive television adaptation for the Rankin/Bass company in 1976. But it’s surprising that readers had to wait more than half a century to see Bilbo Baggins on the big screen. It’s also surprising that the Peter Jackson’s production is only Part One of a three-movie embellishment. The Lord of the Rings, a trilogy, required significant abridgement for the big screen. But The Hobbit is a small, one-volume prologue by comparison. Fans have expressed concern: Can the story survive being stretched to fill three movies? Well, there’s good news and there’s bad news. In The Hobbit: An Unexpected Journey, moviegoers will find the novel’s first six chapters vividly portrayed. Everything, and everybody, look like they should. Bilbo, from his vest with brass buttons to his bare and hairy feet, is perfectly played by Martin Freeman. Freeman’s previous work on British television (The Office and Sherlock) and in the film The Hitchhiker’s Guide to the Galaxy look, in retrospect, like an audition for the part of Bilbo. He brings out Mr. Baggins’ insecurity, his temper, and his capacity to be easily discombobulated. Sir Ian McKellen inhabits the costume of Gandalf the Grey as if he wears it every day. He’s so comfortable, in fact, that one might argue his performance is almost lazy, offering no surprises whatsoever. The dwarf company, on the other hand, are surprisingly engaging company — and surprisingly distinct in their costumes, personalities, and voices. Richard Armitage makes Thorin Oakenshield, the dwarves’ leader, a much more commanding presence than any reader would have expected. Others — especially James Nesbitt as Bofur — are warm and welcome company. And they’re best when they sing together. At Bilbo’s home, Bag End, the dwarves perform two songs, one with frenzied humor and another with solemn and haunting conviction. Many are likely to remember their harmonious fireside lament for their lost kingdom as the film’s most memorable moment. 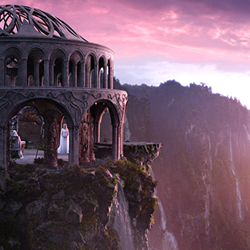 The White Council Chamber in Rivendell, one of The Hobbit’s many scenic wonders. But the finest performance comes from Andy Serkis. Gollum was a highlight of Jackson’s Lord of the Rings trilogy, but the “performance-capture” technology that transforms Serkis into the monster has clearly advanced. Watching Bilbo and Gollum match wits in close quarters, audiences are treated to a level of acting, intelligence, and suspense that is missing in the rest of the movie. Nevertheless — even when the storytelling feels stretched “like butter over too much bread” (to steal a line from Bilbo) — the scenery, set design, and architecture are enough to keep moviegoers slack-jawed with awe, and wishing for a Middle-earth amusement park. To be frank, this movie is an amusement park. One highlight: A Rivendell viewpoint behind a moonlit waterfall, where the moon’s rays reveal secret instructions on an ancient map. The bad news — well, it becomes clear we’ve emerged from the enchantment. For readers, The Hobbit was a grand introduction to Middle-earth fundamentals — the regions, the races, the magic, and Gandalf himself. But here, in this movie, these things are taken for granted, as if we’re all very familiar with them. That may be true for this generation’s moviegoers, but the next generation will find it odd that the Prologue story should be treated as a sort of epilogue-flashback. No one will have a moment to become curious about Gandalf — he’s just there! We aren’t given any time to consider the nature of the Shire, or to ask why Frodo Baggins (Elijah Wood, reprising his role) is hanging around his Uncle Bilbo’s house. (Frodo isn’t even mentioned in the novel.) Gollum’s first appearance is nowhere near as interesting or dramatic as his entrance in The Lord of the Rings. Galadriel, Saruman, Elrond, and others are treated like familiar faces. And Jackson has loaded this film with clever references and allusions for those who have already watched The Lord of the Rings. Now, Smaug’s reign is treated as evidence of Sauron’s rise. Even the Lord of the Nazgûl makes an appearance. But there’s a bigger problem. The filmmakers have turned a beloved children’s story into something almost as graphically violent as The Return of the King. The battle scenes are comical at times, but they’re ferocious, fraught with beheadings and impalings. Jackson seems to have decided that Tolkien’s story needed more warfare, and he’s stuffed snarling orcs into every corner. 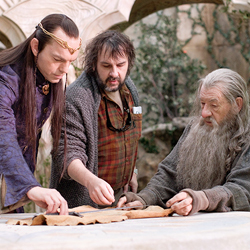 Peter Jackson (center) gives guidance to Hugo Weaving (left) and Ian McKellen (right) for a scene in which Middle-earth’s guardians consider troubling news. And he’s invented a nemesis for Thorin Oakenshield that allows him to set up an inevitable showdown — something that seems trite and incongruous with Tolkien’s storytelling. Rather than enhancing the narrative, it gives the film more video-game potential, and it seems like an attempt to satisfy fans who came expecting epic calamity on the scale of what Jackson staged in The Two Towers. On top of that, Jackson is cavalier in his humor about volatile substances. Radagast the Brown looks like a campaign spokesperson for marijuana legalization. Post-viewing parental counsel may be in order. These complications could have been avoided if the filmmakers had stuck to Tolkien’s “script” and avoided embellishment. Back in 2006, when news of a two-film adaptation broke, film critic Peter Chattaway (Christianity Today, Books and Culture) responded at ArtsandFaith.com with skepticism: “Is there really enough material here for TWO movies? And is there any natural place to put a cliffhanger?” His concerns seemed even more valid when the project became a trilogy. The wearying length of An Unexpected Journey suggests a more appropriate title: The Bloated Adventures of Bilbo Baggins. But it could have been worse. The cast, the special effects wizards, and glorious New Zealand have all contributed to a visually enthralling movie. And seven years ago, in a note to fellow Tolkien enthusiasts, I said I’d like to see Martin Freeman get a shot at playing Bilbo. So, for all of its bloat and its blunders, Jackson’s movie did make at least one wish come true. Hobbits, elves, women, and men — everyone is welcome to explore the world of Response. Response is a magazine for thoughtful Christians worldwide, rooted in the people, life, and mission of Seattle Pacific University. The magazine explores the encounter between education, faith, and culture, and is an informed voice for Christian engagement in the world. Read features from our latest issue, sign up for a free subscription, and visit our archive of movie-related articles. Have you seen The Hobbit? The first Lord of the Rings trilogy? Tell us what you thought about them, and read what others have to say on this moderated bulletin board. July 4, 2013, at 9:02 a.m. I was about 12 when I first picked up The Hobbit -- I put it back down after about Chapter 2 or 3. It was too much a “children’s story” in the worst sense of being rather silly and cartoonish in its treatment of the dwarves and elves -- talking down to the reader rather than telling a compelling tale. I went on to read LOTR instead, finishing it in less than a week. About two years later I returned to TH and enjoyed it more for having read about the larger mythology that “lay beyond the borders” (to use Tolkien's own phrase) of the earlier work. For all the liberties Jackson and Co. have taken with this latest foray into Tolkien’s world, they also understand that the tale of Bilbo has a wider scope in the history of Middle Earth. Also, the novel itself grows in the telling from its homely setting through Bilbo’s encounters with goblins, Gollum, elves, Smaug, and through the Battle of Five Armies, into a slightly darker and, definitely, more epic story. The presence of the Necromancer in TH does indeed presage the return of Sauron and his minions, so Jackson’s inclusion of such characters and events is justifiable. This is not to say that everything about this film is equally justifiable -- e.g., Radagast and the pipeweed plays to nonsense from the ’60s, and Bilbo’s heroism coming so early in the story. Friday, January 4, 2013, at 7:12 a.m. Your review is definitely on point. I loved the book as a child and as an adult, and couldn't wait to take my children to see it. But the violence and gore was so horrendous that I spent the majority of the time covering my children's eyes, so we left the movie after the giant scene. Honestly, I just couldn't take it anymore; they ruined this beautiful story with the graphic violence. So disappointing. Thursday, December 27, 2012, at 9:36 a.m. I saw this movie in 3D, HFR, and iMax: the trifecta for pushing the boundaries of modern film technology (and acronyms cinemas can fit on their ticket stubs!). I have loved the simplicity of the Hobbit (book) while also being captivated by the depth of the LOTR. After seeing the movie, I was left with the impression that Jackson had already conquered the epic Middle-Earth and was ready to have more fun and make a more light-hearted film. Although I agree with Jeffrey's assessment of the battle-gore, I'd also add that the battles felt almost cartoonish and humorous while watching. (How many times did all the bad guys go flying while no dwarf or hobbit received a scratch?) I was also concerned by the three-part issue as many Tolkien fans probably were, but in the end, appreciated the extra time and the overall pace of scenes like the one in Bag-End that didn't feel like the audience was sprinting through the story. Thanks for the great review Jeffrey! Saturday, December 15, 2012, at 2:27 p.m. Excellent review, Jeffrey, and on target in almost every respect. There were so many places in THE HOBBIT that could have been improved by (a) more restraint on Jackson's part, and (b) a little more polish. I hope the next two are slightly better on the polish, but I don't expect much better from Jackson on his restraint. But, like the first three, I expect this movie to grow on one with time. On the 3D and HFR technologies, I guess I'm a bit old school. To me, all the whiz-bang stuff distracts me from the story, and though I enjoy it, I think I'll prefer a plain old 2D version better.